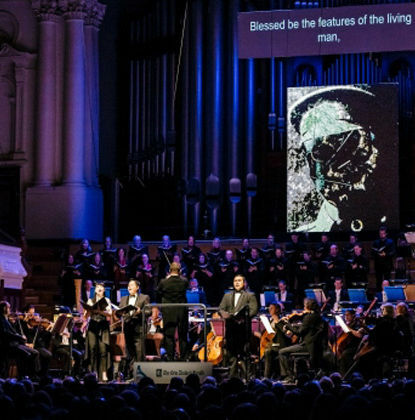 FACE featured symphonic songs and choruses with poetic lyrics written by New Zealand writer Vincent O’Sullican providing descriptions of the landscape of war as well as the hardships faced by the wounded and their loved ones. The work is a modern-day version of a passion play as we follow in the footsteps of a young solider with his wife singing a Madonna-like role. The orchestra provided a rich emotional drama ranging from the peaceful and contemplative to the thunderous and ferocious. Elements of the work were militaristic along with eloquent romantic passages which Harris had carefully structured so chorus, soloists and orchestra created a musical landscape that combined the reality and horror of war, a sense of myth and the pain of individuals. The three soloists were impeccable, their singing bringing an intensity and emotion to their roles as they interacted with the orchestra. Soprano Alison Bell sang the role of a woman who listens to the radio, looks at photographs and waits. She revealed aspects of the impact of the war on her and her husband. Singing the verse This is the right address, her voice had a palpable anguish to it. Tenor Henry Choo as the soldier wondering about the impact of his new face gave a thoughtful performance, his voice hinting at apprehension and despair. Joel Amosa’s rich bass voice was a strong contrast to Choo and Bell with a voice of authority. The VOICES NZ Chamber Choir was finely integrated into the work and provided some passages of outstanding singing, both with harsh battle-inspired sounds as well as subtle passages as when members sang sotto voce. The impact of the work was heightened by the use of large projected images created by Tim Gruchy, based on an original artwork by Barry Cleavin. These depicted a collage of faces, abstract shapes, images of toy soldiers and wasteland. The work played before FACE was Vaughan Williams’ Lark Ascendingand there were references to larks in the singing of FACE. Given the context of the concert, the Vaughan Williams work seemed more profound. Rather than a pastoral work celebrating the coming of spring, there was a sense of the birds being the souls of men ascending from the battlefield. Violinist Yanghe Yu gave the work a spirited interpretation with a fragility and lightness, without any of the cloying sweetness that can often mar performances of the work. Where Lark Ascendingwas an appropriate work to play before FACE, the work which followed, Elgar’s Enigma Variations,seemed to make another connection. FACE concluded with soldiers embarking on new lives. Elgar’s portraits of friends gave an additional sense of hope and of new futures. Dutch conductor Antony Hermus flawlessly conducted the Williams and Harris works but with the Elgar he was transformed. He became a dramatic performer in his own right, cavorting, crouching and dancing on the podium. The way he conducted with his hands appeared to be some form of semaphore communication and at times he appeared to be playing an unseen instrument. He provided a witty and dramatic telling of the work. FACE will be performed by the BBC Symphony Orchestra at the Barbican, London, this Saturday, along with Maurice Ravel’s Le Tombeau de Couperin, John Adams’ The Wound Dresserand Ralph Vaughan Williams’ Fantasia on a Theme by Thomas Tallis. Forthcoming APO Concerts include The Planetson May 10 featuring Debussy’sImages pour orchestre, Tchaikovsky’s Variations on a Rococo Themeand Holst’sThe Planets; and Organ Symphonyon May 17 featuring Lilburn’s Aotearoa Overture, Sibelius’ Violin Concertoand Saint-Saens’ Symphony No 3, Organ.